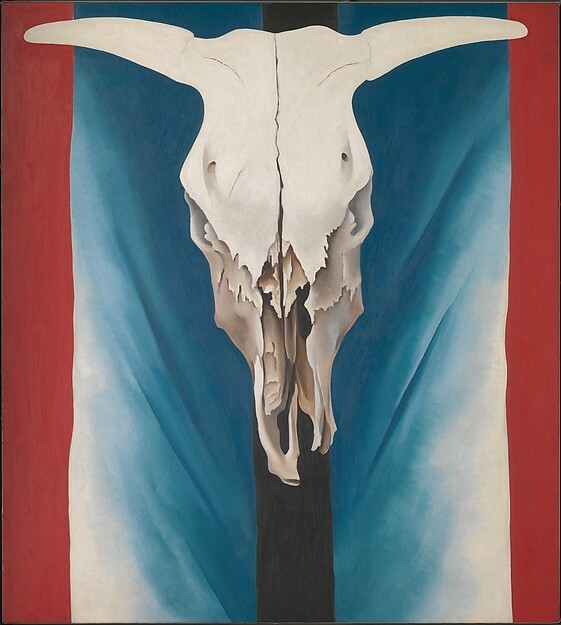 Georgia O’Keefe, Cow’s Skull: Red, White and Blue, 1931 (via Metropolitan Museum of Art). It’s a good, if ambitious, question to set. Meat is murder. Meat—especially beef—is cigarettes and a Hummer rolled into one. For the sake of the animals, our own health, and the health of the planet, we must eat less of it. Meat is delicious. Meat is nutritious. Global demand is soaring for good reason, and we must find a way to produce more of it. In short, meat—especially beef—has become the stuff of fierce debate. 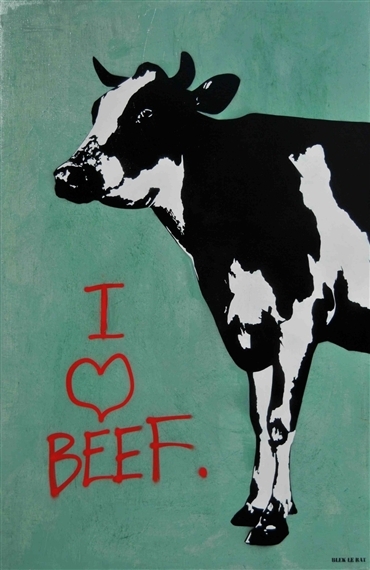 Blek Le Rat, I Love Beef (street art) (via Wikiart). ‘People can’t settle that debate for others—Americans, say, can’t decide how much beef or other meat Chinese should eat as their living standards improve. But each of us takes a personal stand with every trip to the supermarket. Critics of industrial-scale beef production say it’s warming our climate, wasting land we could use to feed more people, and polluting and wasting precious water—all while subjecting millions of cattle to early death and a wretched life in confinement. Most of us, though, have little idea how our beef is actually produced. Last January, as part of a longer journey into the world of meat, I spent a week at Wrangler, in Tulia, Texas. I was looking for an answer to one fundamental question: Is it all right for an American to eat beef? . . .
‘In 1976 per capita beef consumption peaked in the United States at 91.5 pounds a year. It has since fallen more than 40 percent. Last year Americans ate on average 54 pounds of beef each, about the same amount as a century ago. Instead we eat twice as much chicken as we did in 1976 and nearly six times as much as a century ago. It’s cheaper and supposedly better for our hearts. 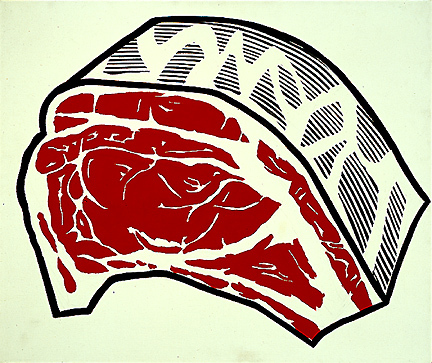 We slaughter more than eight billion chickens a year now in the U.S., compared with some 33 million cattle. . . .
Roy Lichtenstein, Standing Rib, 1962 (via Wikiart). In 2013 the U.S. produced almost the same amount of beef as it did in 1976, about 13 million tons. It achieved this while slaughtering 10 million fewer cattle, from a herd that was almost 40 million head smaller. The average slaughter animal packs 23 percent more meat these days than in 1976. To the people at Cactus Feeders, that’s a technological success story—one that meat producers will need to expand on as global demand for meat keeps rising. . . .
‘Are feedlots sustainable? The question has too many facets for there to be an easy answer. . . . The issue that concerns Defoor most is water. The panhandle farmers who supply corn and other crops to the feedlots are draining the Ogallala aquifer; at the current pace it could be exhausted in this century. 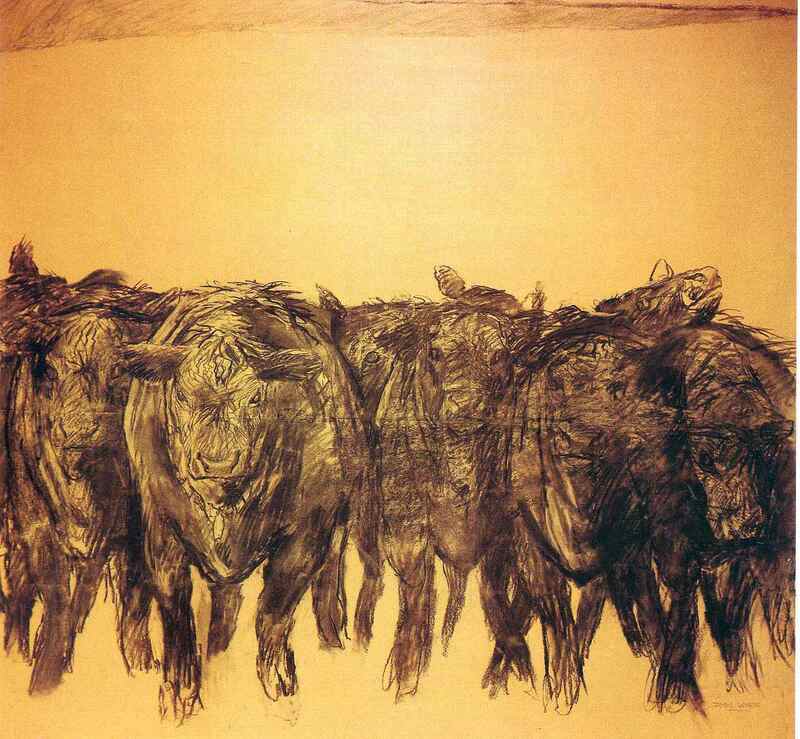 But Texas feedlots long ago outgrew the local grain supply. Much of the corn now comes by train from the corn belt. The biggest, most mind-numbing issue of all is the global one: How do we meet demand for meat while protecting biodiversity and fighting climate change? A common argument these days is that people in developed countries need to eat less meat in general, eat chicken instead of beef, and, if they must eat beef, make it grass fed. I’ve come to doubt that the solution is that simple. . . .
Jamie Wyeth, Angus, Study, 1974 (via Wikiart). ‘[W]ould Americans help feed the world if they ate less beef? The argument that it’s wasteful to feed grain to animals, especially cattle—which pound for pound require four times as much of it as chickens—has been around at least since Diet for a Small Planet was published in 1971. The portion of the U.S. grain harvest consumed by all animals, 81 percent then, has plummeted to 42 percent today, as yields have soared and more grain has been converted to ethanol. Ethanol now consumes 36 percent of the available grain, beef cattle only about 10 percent. Still, you might think that if Americans ate less beef, more grain would become available for hungry people in poor countries. ‘There’s little evidence that would happen in the world we actually live in. Using an economic model of the world food system, researchers at the International Food Policy Research Institute (IFPRI) in Washington, D.C., have projected what would happen if the entire developed world were to cut its consumption of all meat by half—a radical change. “The impact on food security in developing countries is minimal,” says Mark Rosegrant of IFPRI. Prices for corn and sorghum drop, which helps a bit in Africa, but globally the key food grains are wheat and rice. If Americans eat less beef, corn farmers in Iowa won’t export wheat and rice to Africa and Asia. 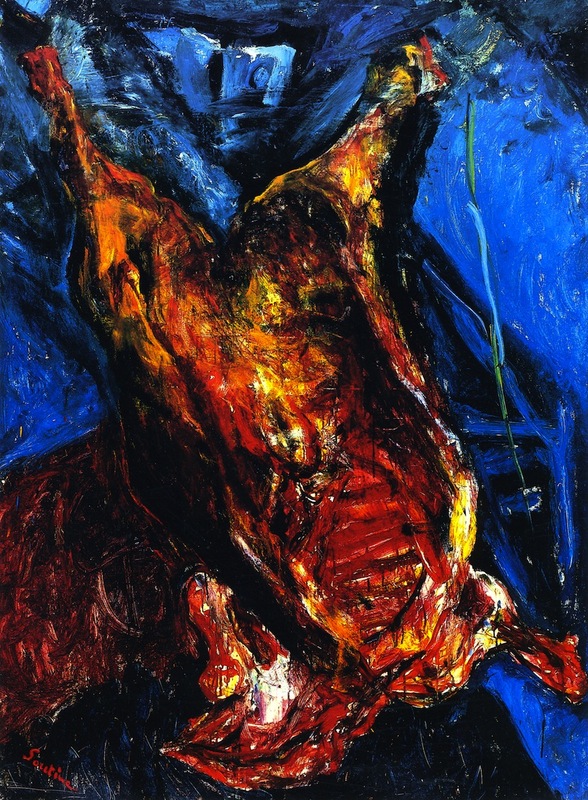 Chairn Soutine, Carcass of Beef, 1924 (via Wikiart). ‘The notion that curbing U.S. beef eating might have a big impact on global warming is similarly suspect. A study last year by the UN Food and Agriculture Organization (FAO) concluded that beef production accounts for 6 percent of global greenhouse gas emissions. But if the world abstained entirely from beef, emissions would drop by less than 6 percent, because more than a third of them come from the fertilizer and fossil fuels used in raising and shipping feed grain. Those farmers would continue to farm—after all, there’s a hungry world to feed. ‘If Americans eliminated beef cattle entirely from the landscape, we could be confident of cutting emissions by about 2 percent—the amount that beef cattle emit directly by belching methane and dropping manure that gives off methane and nitrous oxide. We made that kind of emissions cut once before, in a regrettable way. According to an estimate by A. N. Hristov of Penn State, the 50 million bison that roamed North America before settlers arrived emitted more methane than beef cattle do today. ‘The problem of global warming is overwhelmingly one of replacing fossil fuels with clean energy sources—but it’s certainly true that you can reduce your own carbon footprint by eating less beef. If that’s your goal, though, you should probably avoid grass-fed beef (or bison). . . . If we were to close all the feedlots and finish all cattle on pasture, we’d need more land and a much larger cattle herd, emitting a lot more methane per animal, to meet the demand for beef. 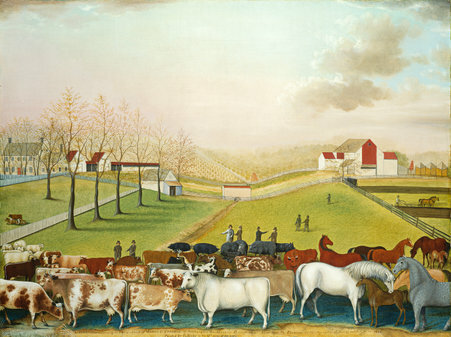 Edward Hicks, The Cornell Farm, 1848 (via National Gallery of Art). ‘Even proponents acknowledge that grass-fed beef can’t meet the U.S. demand, let alone a growing global demand. . . .
There’s no doubt that eating less beef wouldn’t hurt me or most Americans. But the science is unclear on just how much it would help us—or the planet. Read the whole illustrated feature article written by Robert Kunzig and photographed by Brian Finke at National Geographic: Carnivore’s dilemma, Nov 2014. Tags: IFPRI, Livestock goods and bads, National Geographic. Bookmark the permalink. Great read. Thanks Susan. Personally i eat beef, pork and chicken. I also know that with sustainable green farming I can eat my meat and have it, saying anything more might label me a ‘meat zealot’!